The monument was built in 1960 for the 500th-year celebration of Henry the Navigator's birth. 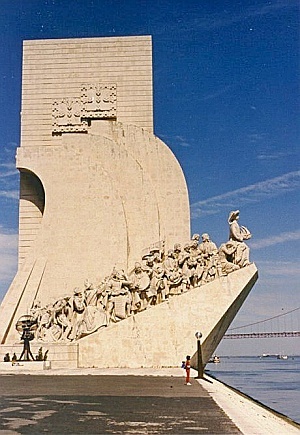 It takes the shape of the prow of a 15th-century boat, points directly to the river Tago (Lisbon), with people looking forward to the future. Right at the bow of the ship is a Henry the Navigator himself, holding a model of one of the caravelas which the Portuguese used to sail the oceans. Behind him is a procession of personalities connected to the discovery of India and the new world. This includes Vasco da Gama, Cristovao Columbus and Portugal's national poet Luis Camões who wrote "The Lusiads" . Inside there is a lift to the top where people have a magnificent view.